Beachamwell or Beechamwell comes from the Old English meaning ‘the spring at Bicca’s homestead’. It is a large parish in the heart of Breckland, and has been an important area of settlement since at least the Neolithic period. Beachamwell was originally two distinct settlements, ‘Bitcham’ and ‘Wella’, which gradually amalgamated during the medieval period. Large numbers of Neolithic flints have been found within the parish, including axeheads (NHER 12277), knifes (NHER 12278), arrowheads (NHER 25028), scrapers and flakes. The remains of a possible Neolithic cursus (NHER 22997) are visible on aerial photographs, suggesting that Beachamwell has long held a special significance. Large numbers of flints found throughout Breckland suggest that the area was quite densely settled in the Neolithic period. At least nine possible Bronze Age barrows are known to exist in the parish (NHER 4530, 4560, 4531, 4532, etc. ), and many Bronze Age artefacts have been recorded, including a dagger (NHER 4486), and a hammer (NHER 4533). The poor nature of the soil means that the land has not been cultivated as intensively as other areas of the county, and a higher number of prehistoric monuments, such as Bronze Age barrows, are likely to survive. Settlement continued to develop throughout the Iron Age, and pottery fragments have been found whilst fieldwalking (NHER 4534 and 4537), and a linch pin, which may have come from a chariot has been found close to course of a Roman road (NHER 2796). 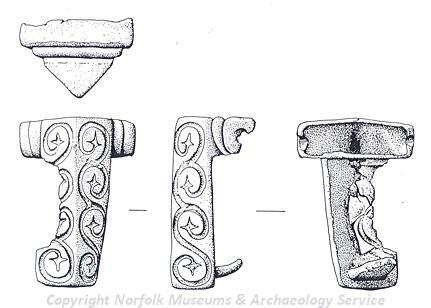 Large amounts of Roman pottery have been found whilst fieldwalking, as well as pewter dishes (NHER 6244), enamelled brooches (NHER 31126), and two coin hoards (NHER 4543 and 22035), found in the 19th century. Although no remains of Roman buildings have been found in Beachamwell, it is clear that the parish remained settled throughout the period, and the remains of some of Beachamwell’s Roman inhabitants have been found close to the village (NHER 4561). A section of the Bitchamditch or the Devil’s Dyke (NHER 3937), a large linear earthwork from the Early Saxon period, runs through the north of the parish, built over the Roman road (NHER 2796). Metal detecting has recovered Saxon brooches (NHER 25717), buckles (NHER 4539), rings (NHER 25476), pottery (NHER 21926) and other metalwork from the parish, around the present areas of settlement in Beachamwell and Shingham, and the small Roman cemetery (NHER 4561) was reused in the Early Saxon period. St Mary’s Church (NHER 4547), mentioned in Domesday Book, is a Late Saxon building, with a round tower and Late Saxon windows, as well as incorporating a reused gravestone dating to around 1050. Modern settlement in the parish is concentrated on the hamlets of Beachamwell and Shingham. The latter name comes from the Old English meaning the ‘homestead of Scene’s people’. In the early medieval period settlement in the parish was much more widespread, with four churches. The earthwork remains of medieval settlement (NHER 2635, 11964 and 13919) have survived around the present villages, including medieval moated sites (NHER 4508 and 19277), which were probably manorial sites. St John’s Church (NHER 4507) is in ruins, St Botolph’s Church (NHER 4559) is no longer in use, and All Saints’ church (NHER 2635), where a rare fragment of a Late Saxon cross was found, has collapsed. Medieval ridge and furrow (NHER 16717), and earthwork banks within Nut Wood (NHER 40177), which are probably the remains of earlier field boundaries, show how much settlement has contracted in the parish from the late medieval period, although some areas of settlement struggled on well into the post medieval period. The north of the parish is dominated by Beachamwell Warren, and the right of free warren was fiercely guarded by local landowners during the medieval and post medieval periods. After World War One, the shortage of timber prompted the creation of large plantations in Breckland, and in 1924 the Forestry Commission acquired over 800 acres of land from the Beachamwell estate, where a large coniferous plantation was established. During the Cold War an underground listening post used by the Royal Observer Corps (NHER 35426) was constructed on the parish boundary, and is a site of national importance. Sarah Spooner (NLA), 9 August 2005.